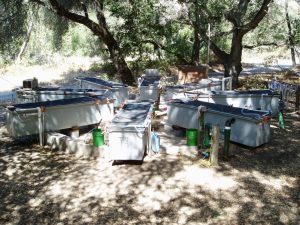 The Sleepy Hollow Steelhead Rearing Facility was designed in the early 1990s to hold juvenile steelhead rescued from the lower Carmel River during the summer. Construction of the Facility began in late 1995 and the first test fish were received in late 1996. With an estimated capacity of approximately 47,000 juvenile fish, the Facility is comprised of an 800-foot-long, naturalized rearing channel, a large 22-foot diameter holding tank, eight 150 gallon rearing troughs, and six 8-foot diameter quarantine/holding tanks. A small, 800 square-foot, office/lab/shop building is also on site. 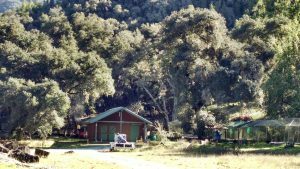 Water for the Facility is supplied directly from the adjacent Carmel River by two large submersible pumps. After traveling through a cooling tower to reduce the temperature, up to two cubic-feet-per-second (cfs) of river water is piped to the rearing channel and tanks before being discharged back into the river approximately 300 feet downstream of the inlet. 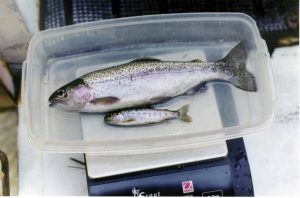 Fish are generally held in the Facility from early summer to late fall depending on river flow and weather conditions. Once flow has returned to the lower river, the fish are recaptured, counted, and then released back into the river. To date, nearly 100,000 healthy steelhead have been successfully reared and released from the facility.